Hey y’all – it’s been a while since we’ve had a Tech Tip – and today I have a very low tech one for you. 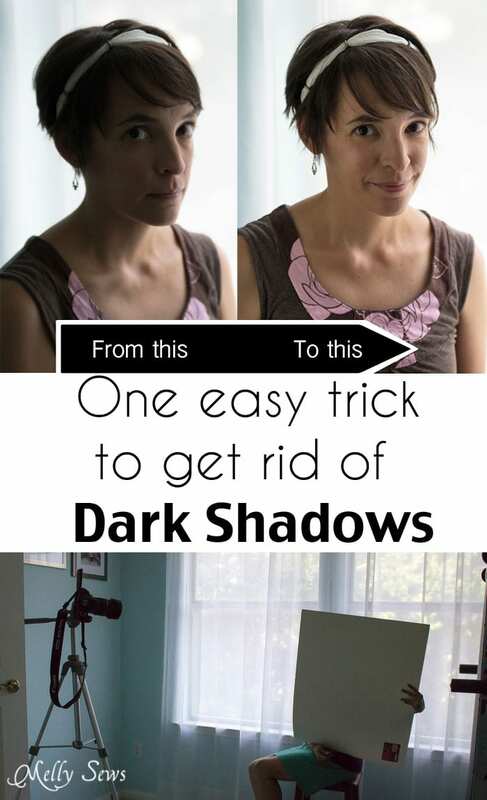 So low tech it costs less than a dollar – how and what to use as a light reflector to get rid of dark shadows in photos. 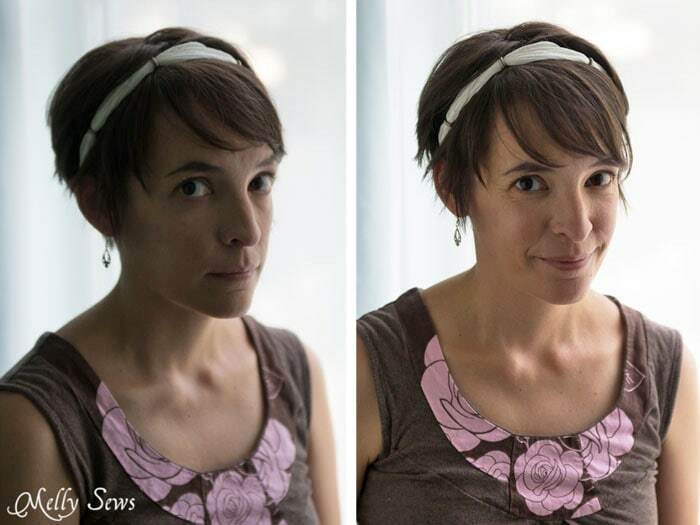 Below is a pullback shot of photos I was taking of some DIY headbands. This is part of my bedroom, where the trees and the curtains create great soft light for photos. However, when you’re as close to a light source as I was for these photos, the camera has a hard time with exposure because the amount of light on each side of your body is so different. That’s when you use a reflector. Which can be as simple as what I used below – a piece of white posterboard. The shot below is another pullback that lets you see what the posterboard does to help with shadows. I angled it as close as I could to my face without it being in the shot. Since white reflects light, this bounces some of the light from the window back into the shadows on the side of my face. If you have to hold the reflector further away or need more light reflection, you can also cover a piece of foam board with aluminum foil. That increases the amount light that gets bounced from the main light source back onto the subject. Here are two shots for comparison – on the left is what the shot looks like without the reflector. 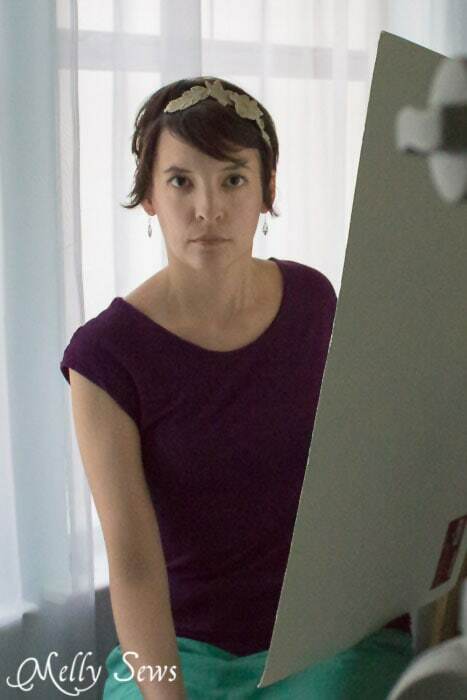 Even upping the exposure in editing still leaves those shadows and you can’t quite see details on the side of my face away from the window. In the shot on the right I’m sitting in the exact same place, but using the reflector just out of frame. And now there are still subtle shadows on my face (with no shadows faces etc. can look flat) but you can see the detail in the shadows – like the lines around my eyes, ha! So hopefully this tip helps you get better photos – without spending a lot of money! See more Tech Tips here. Thanks for sharing! What a great tip for those days that you have to shoot indoors! Who knew? Not me! Thank you! My photographer friend suggested this to me, when I bought my white backdrop. I meant to do it and now that I see it in action, why have I waited! Fab Melissa! Thanks! Great tip, Melissa, thank you! This is exactly what I was just learning in a Craftsy class on this subject. Great to see how well it works!